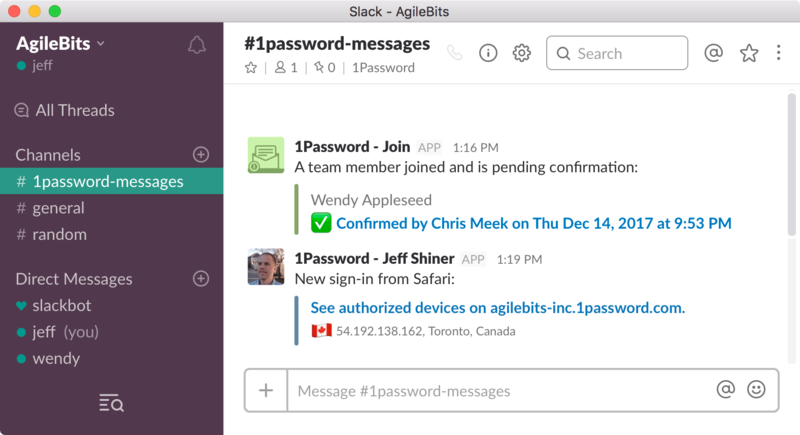 Learn how to set up and configure the 1Password Slack app for your team. 1Password can automatically post messages in Slack when events happen on your team, like when new team members join or when someone signs in on a new device. Sign in to your 1Password account, click Settings in the sidebar, then click Slack to get started. To add the 1Password app to Slack, click Add to Slack. If you’re not already signed in to Slack, sign in. Then click Authorize. You can configure 1Password to post alerts, notifications, or both, and choose any public channel for each. After an action is completed, the message is automatically updated, so everyone else can see that it’s been resolved.